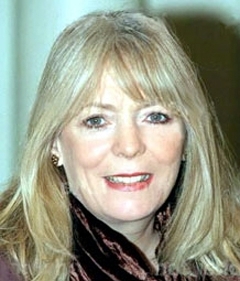 Alison Steadman OBE (born 26 August 1946) is an award-winning English actress. Steadman was born in Liverpool, Merseyside, England, the daughter of Marjorie (née Evans) and George Percival Steadman, who worked for an electronics firm as a production controller. As a child she attended a youth theatre and after leaving school at 16 she trained as a secretary and worked in a probation office as a clerical assistant. She moved to London and in her 20s enrolled in the East 15 Acting School, where she met Mike Leigh. They married in 1973 and had two sons, Toby in 1979 and Leo in 1981. They separated in 1995 and divorced in 2001. Her present partner is Michael Elwyn and she currently lives in Highgate, London. Her television work include Fat Friends as Betty, Grumpy Old Women, Selling Hitler, Let Them Eat Cake, The Singing Detective, No Bananas The Caucasian Chalk Circle, and Pride and Prejudice as Mrs. Bennet. She also provides a voice over in the children's TV show Bob the Builder. Television productions directed by Leigh in which she has appeared include Nuts in May, and most famously Abigail's Party. She also appeared in the BBC comedy The Worst Week of My Life. In 2007 she has been seen in the BBC Three comedy Gavin & Stacey as Gavin's proud mother Pamela, and in Fanny Hill on BBC Four.